A night on the town might mean a fancy dinner or dancing for some, but for us it means thrifting. The couple that thrifts together, stays together. One place that makes us both happy is the Habitat for Humanity ReStore. Upon a recent night on the town, we explored a new ReStore in our area. In one little corner there were all these brand new cabinet doors priced at $1 or $2 each!!!!!! They must have been from a remodel, or new home, and something when wrong. Their loss turned our gain. Yep, grabbed those up real quick like. *Affiliate links used to show like or same products used to complete this project. 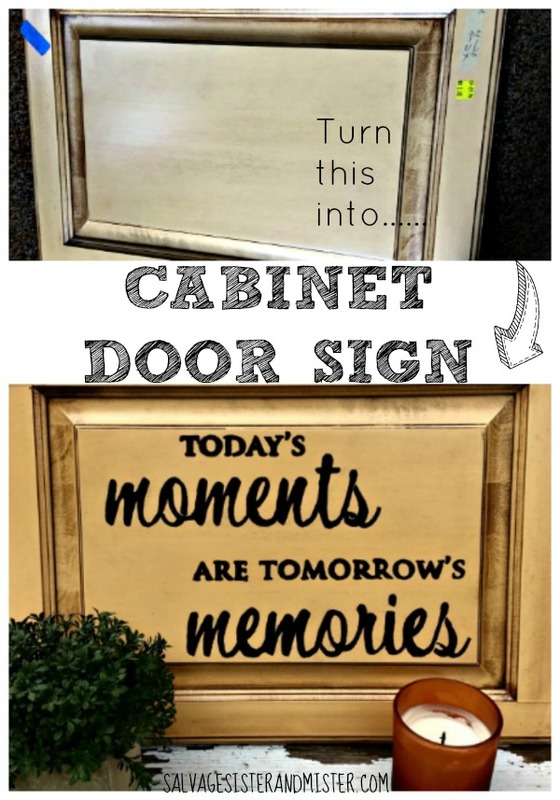 Turning these doors into a Cabinet Door Sign is super easy. Wipe or clean off door as needed (if really grimy this is great). Distress if desired, by sanding lightly or applying an antiquing glaze. Dap paint on stenciled area, carefully making sure you don't apply too much. Also, don't apply in a back and forth motion as you will end up with paint under the stencil. THIS WORKS GREAT. Carefully remove tape and peel off stencil. Take a Q-tip and some water to remove any mistakes. Take a very thin paint brush to clean up any strokes, if needed. Apply a top coat to prevent scratches to the paint. Turn sign/door over to attach picture hangers. Two, on either side, if it's a heavy door, one if it's a light door. Since we already owned the stencil and paint, this was a very inexpensive décor item. These can be great to keep, give as gifts, or sell. If you are good at free hand painting, you wouldn't even need a stencil. We hope you will give this project a try whether you use old doors you have or get all dressed up and head over to your local Thrift/ReStore. Thanks so much to Kim for letting us share this project with you.